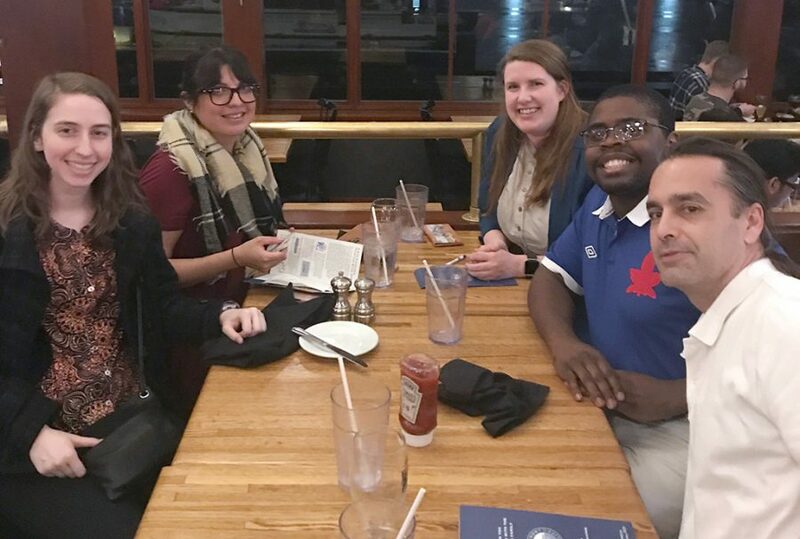 Emily Holub, political science adjunct professor; Natalia Zamora, political science and global studies senior, Tiernan Harris, political science graduate, Herbert McCullough, political science senior, and Steve Garrison, political science chair, having dinner at Pier 39. Contributed photo. Three students and four professors presented at the International Studies Association conference in San Francisco from April 4-7. Steven Garrison, chair of the political science department, said this is the highest number of MSU students and faculty members who presented at an ISA conference. Natalia Zamora, political science and global studies senior, was one of the undergraduate students. Garrison said it is unusual for undergraduate students to present papers at ISA or other conferences at that level. “My favorite professor told one of my students that they have summarized their paper better than her graduate students,” Garrison said. Tiernan Harris, political science graduate, explained the rigorous process of submitting a paper and presenting to ISA. Garrison said ISA was the first academic conference he was a part of. He presented a paper with his former professor in 1996. “She made me realize how important it is for teachers to take their students to these conferences,” Garrison said. Zamora explained how nervous she was giving a presentation at the ISA conference. Zamora said the most important thing she had learned from ISA was preparation. “It would be the importance of being prepared before arriving at the conference since it was a professional conference and being prepared is very important,” Zamora said. Zamora explained the comparative case study she has conducted with Linda Veazey, associate professor of political science, as well as another student. She also explained the future of this research project. Garrison explained his research project which was different than most of the projects he had previously done. Harris said her mentor, Brandy Jolliff-Scott, assistant professor of political science and coordinator of global studies, was vital in preparing her for the conference. Garrison said his former professor was also a valuable mentor to him in preparing for his first ISA conference. Zamora said her favorite part of ISA was spending time with the MSU students and faculty. Tiernan Harris, political science graduate, said her favorite part of ISA is the traveling. “I really enjoy the travel,” Harris said. Harris said her favorite part of ISA was being around the different students and faculty members who presented their papers. “I enjoy being around great thinkers and people I can associate with. Even if I don’t agree with everything they are saying, there is a manner of respect for each other,” Harris said. Garrison said his favorite part of ISA is being exposed to new ideas and research. “I like the new ideas and being exposed to new research before it is actually published so you can know what is out there ahead of time,” Garrison said.